International grandmaster Gennady Shapiro (Germany) won 9th Open German Draughts-64 Championship. 2.) 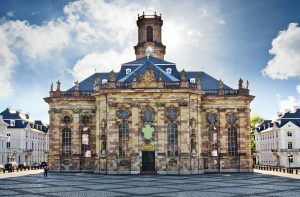 Organizer: Interessengemeinschaft Damespiel in Deutschland, Verein Saarheimat e.V. 3.) 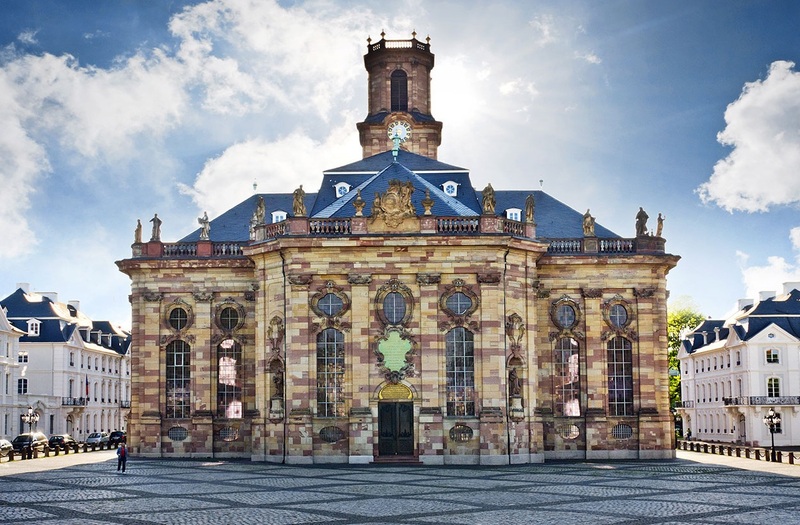 Venue: The Saarbrücken Open Draughts Tournament takes place in Saarbrücken (Germany), Address: Meerwiesertalweg 31, 66123 Saarbrücken, phone: 49-681-33040. Registrations for participants who need an entrance visa, should be submitted until the 10th september 2018 including country, name and birthday of the player, also the number of the foreign passport (if a visa is necessary). 6.) Approach: By train: Train station is Saarbrücken-HBF (main station), from there by bus line 124 to the station „Prinzenweiher“. 7.) Inscription fee: Adults 15 Euro, juniors up to and incl. 18 years – 7 Euro. For the Open German Draughts 64 Championship – 10 Euro. 8.) Play mode: 7 rounds by Swiss System under the rules of the FMJD, also at the Open German Draughts 64 Championship. 9.) Game speed: 35 min. + 5 seconds per move (Fischer System) per person until the end of the game. At the Open German Draughts-64 Championship 25 min. + 3 sec. per move. 12:00 – 13:00 h: 7th round; 13:30 h: Award ceremony. 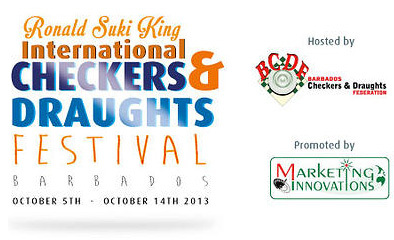 11:30 – 13:00 h: 7th round; 14:00 h: Award ceremony, then departure of the participants. with 30 participants 200 € – 100 – 60 – 40 guaranteed. Best woman 30,00 €. Winners of the Open German Draughts-64 Championship 100 €. 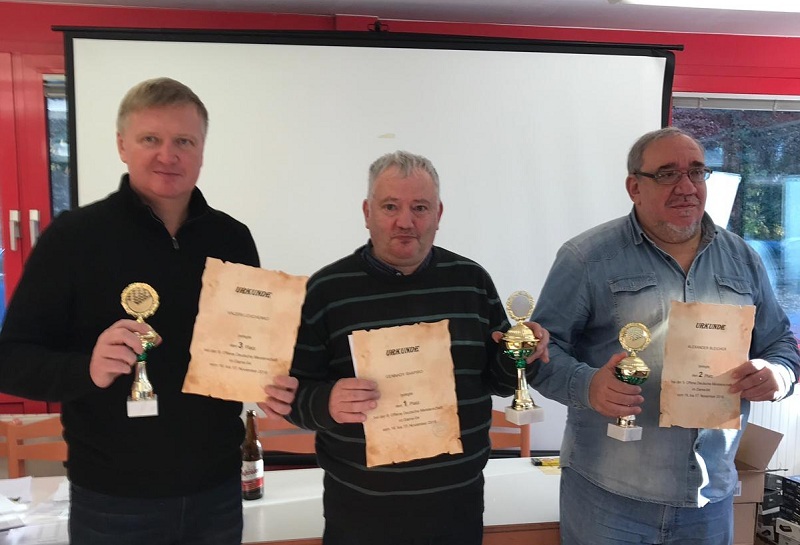 The best 3 players and the best woman, the best senior and the best junior in both tournaments received cups and certificates. 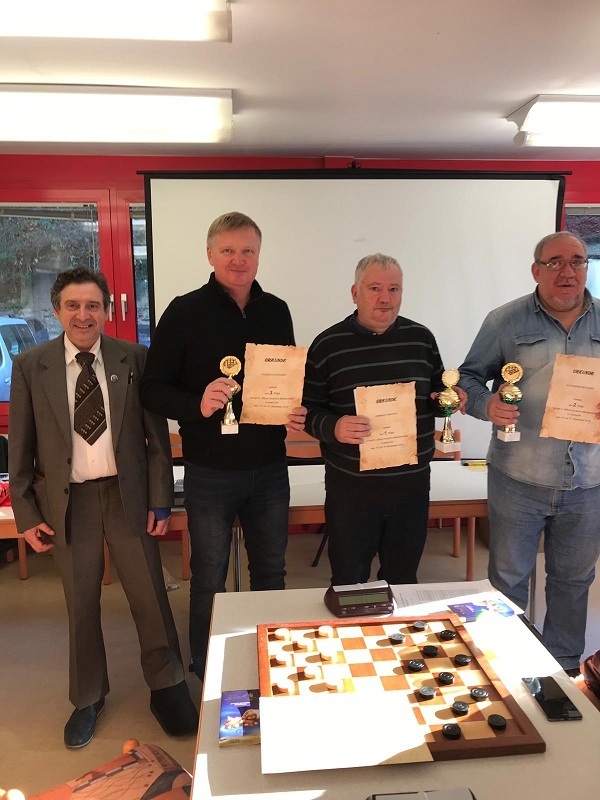 19-11-2018 9th Open German Draughts-64 Championship (Brazilian version) was held November 16 and 17, 2018, during the Saarbrücken-Open International Tournament in Saarbrucken (Germany). 24 players from Germany, Holland, Kazakhstan, Russia and Ukraine took part in the competition. 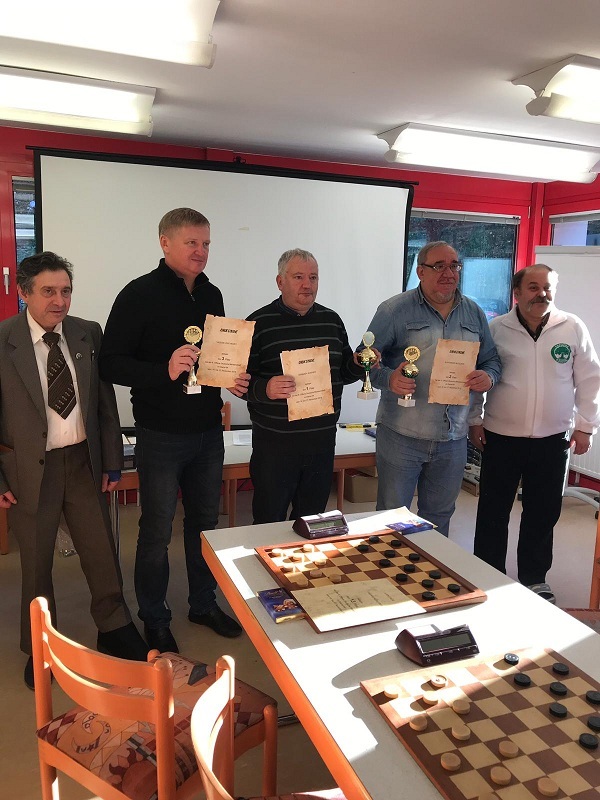 The winner of the tournament became international grandmaster Gennady Shapiro from Germany. He had a better coefficient than Alexander Bleicher, who finished second. They have 11 points each. Valeriy Levchenko (Ukraine) took the third place with the result of 10 points.